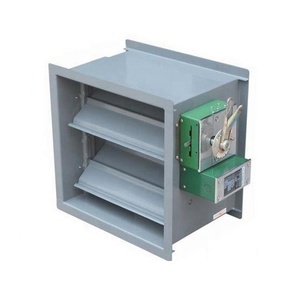 Specifications: ID: 50mm-400mm Steel wire thickness: 0.8-1.4mm Temperature range: -30 to +150 degree Celsius Air velocity: Max. 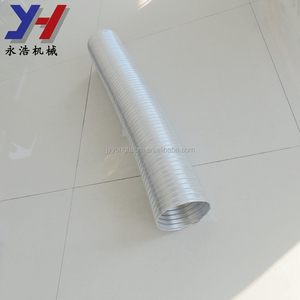 30m/s Construction: it is a multiply aluminum and pvc laminated ducting with high tensile steel wire helix Feature: 1.Full flexible, lightweight, suitable for medium pressure air conditioning and ventilation system 2.It&rsquo;s a range of fully flexible uninsulated aluminum pvc laminated ducting, it is easy to connect to ducting 3.Excellent resistance to chemicals Application: Ventilation system, Extraction of solvents, Extraction of corrosive gas and fumes Low pressure application, Transfer of hot and cold air, Air conditioning Vehicle construction, Engine construction, Exhaust fumes extraction Generally used for smoke and dust exhausted. bathroom for air exhausting Advantages: it needs no special tools for cutting ;in case of fire no toxic gases are emitted;the products have been successfully tested for fire resistance. 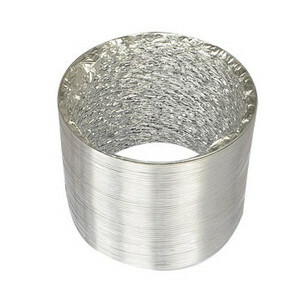 OEM ODM factory manufacture SGS ISO ROHS custom length 8 series aluminum aluminum foil vent tube as your drawing Product develop metal parts and rubber parts according to customers&rsquo; demand. Surface treatment zinc plated, nickel plated, tin plated, brass plated , silver plated, gold plated, anodizing , Heat treatment , salt fog test , chain plating, hanging plating, rolling plating, etc. Application Our products are widely used in electronic appliances, lighting, switch, sanitary, sanitary ware, jewelry, watches, toys, furniture, gifts, handbags, umbrellas, doors and windows, etc. Can be easily fitted to oval connectors. 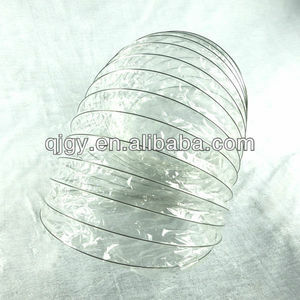 Temperature range: -30&deg;C ~ 140&deg;C. Operating pressure: 2500pa (max.). Qingdao XLiangMo Agriculture Technology Co., Ltd.
Also we would like to have seamless cooperation with your forwarder at your convenience. Manufacture the machine according to your and accessories. Free repair whole using life(without the freight and accessories charge). It is built tough and ready to withstand the abuse received from extreme environments and transportation between job sites. v Our products have received acclaims for their performance, use and value while can be easily stacked by transportation and storage. Moreover, with our excellent service and competitive price, we believe that we will be your first and only choice for blowers. Durable aluminium construction, it's have waterproof function, and get the UL Certificate. 1. Central supplied for your company with wa rehouse in North America , logistics is our big advantage. 3. 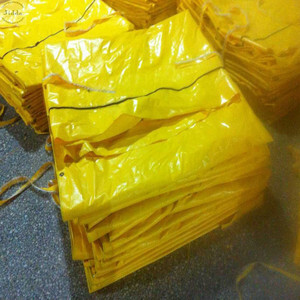 Can you provide sample9 Yes, we can offer sample, and sample fee is negotiable. Foshan Vairtech Ventilation Co., Ltd. Advantages With these advantages of reasonable design , superior materials , manufacture of high precision , complete variety , easy installation and etc. The air diffusers/grilles are all made of high quality aluminum alloy extrusions, its surface is processed by anodic oxidation, so it is smooth , clean , beautiful , corrosion resistance . The color of air diffuser/grille is natural color of aluminum-alloy (silver white), also can be other color according to customers&rsquo; requirement by spraying plastic . 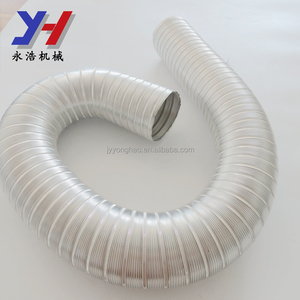 It was designed especially for the needs of the ventilation and air conditioning market. Q4: What's your lead time9 3-7 days for the sample orders in the stock. 2) We have our own R&D team, the products can be customized according to your requirements. We use aluminum mould and fine sand to make sure the surface smooth. We don't use any chaplet in the radiaors in length less than 700mm. Because of the environment protect policy, the foundry of radiators are not in Jiangsu. 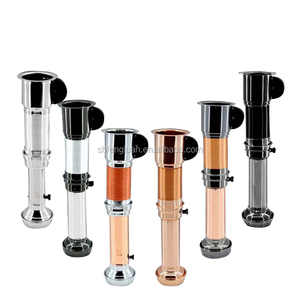 Alibaba.com offers 2,182 vent tube products. About 4% of these are hvac systems & parts, 3% are plastic tubes, and 1% are steel pipes. A wide variety of vent tube options are available to you, such as ventilation, hvac systems, and air conditioning. You can also choose from free samples, paid samples. 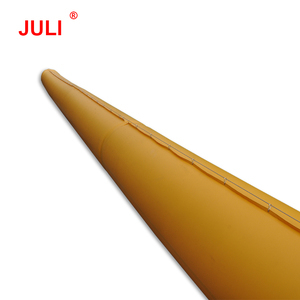 There are 2,106 vent tube suppliers, mainly located in Asia. The top supplying countries are China (Mainland), Taiwan, and India, which supply 98%, 1%, and 1% of vent tube respectively. Vent tube products are most popular in North America, Western Europe, and Domestic Market. You can ensure product safety by selecting from certified suppliers, including 516 with ISO9001, 216 with Other, and 144 with ISO13485 certification.